Welcome to Waters Edge! 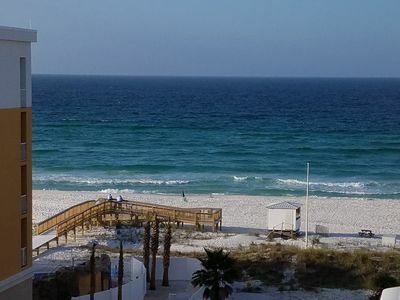 Located in Fort Walton Beach, Florida. 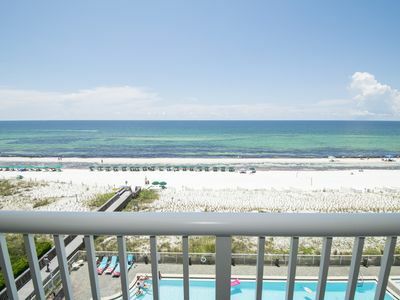 Emerald waters, white sand, and panoramic views of the Gulf await! 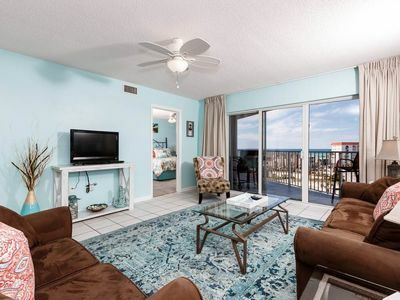 This privately owned and managed 5th floor platinum unit containing 3 bedrooms and 3 bathrooms offers guests luxury and comfort! 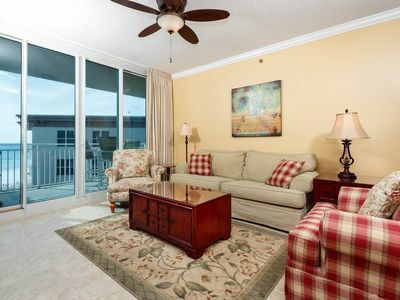 An open concept floor plan provides a spacious feel in this professionally decorated unit. 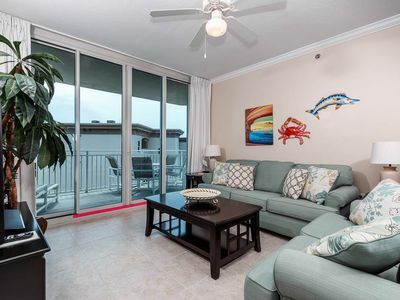 Recently renovated and well appointed with: new flooring in all bedrooms, new sleeper sofa, new washer, new furnishings, fresh paint and an updated kitchen containing granite countertops and stainless steel appliances. 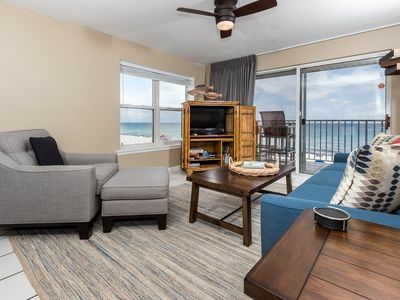 The elegant master suite features a king size bed, Jacuzzi tub, walk-in shower, his and hers sinks, walk-in closet, flat screen TV, and balcony access. 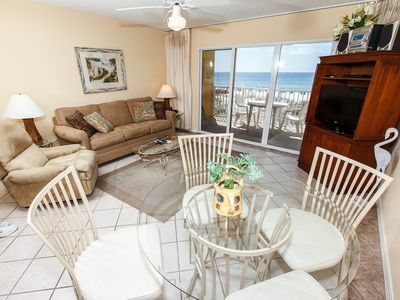 The second bedroom provides a king size bed, attached full bath, chic décor, ample closet space and a flat screen TV. 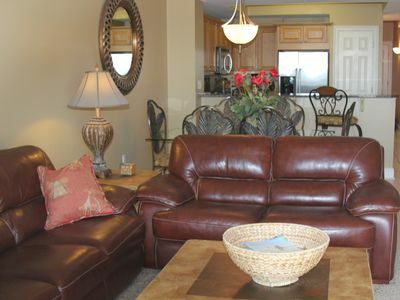 The third bedroom provides a queen, a full bath, boutique furnishings, ample closet space, and a flat screen TV. Hall bunks and a new queen size sleeper sofa bring the units sleeping capacity to 10! 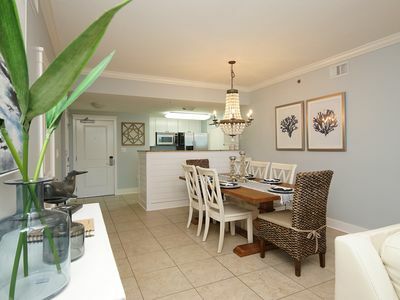 A stylishly designed fully equipped kitchen will meet all your needs. 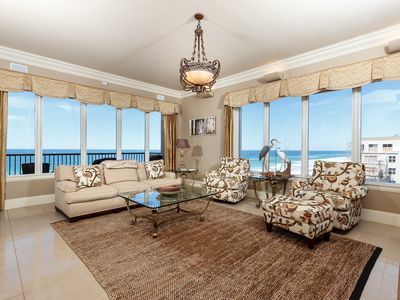 An exquisitely decorated, open dining/living room combination featuring panoramic view of the Gulf and balcony access provides a stunning setting for entertainment and relaxation! 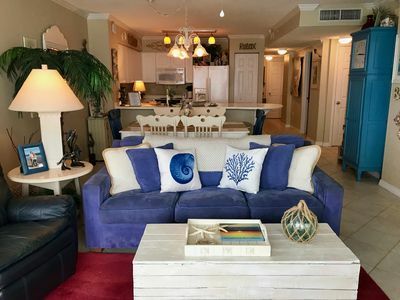 Furnishings include 4 bar stools, designer rectangular dining table that seats 6, sleeper sofa, swivel side chair, DVD player and Flat Screen TV. 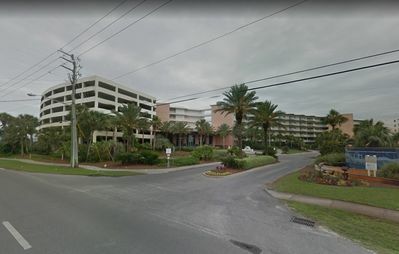 Located on Santa Rosa Boulevard just off Highway Ninety Eight, Waters Edge offers convenient access to shopping, grocery stores, restaurants and entertainment. 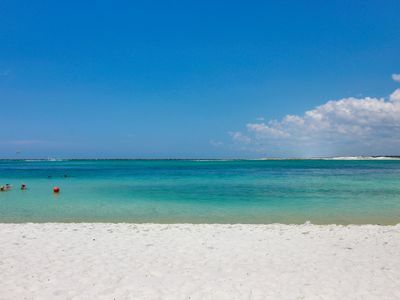 Bask in the sun on one of the most beautiful beaches in the world! 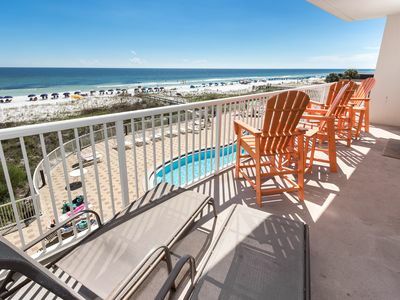 Or indulge in one of the complex's two beautiful Gulf-Side pools (one heated) in a serene tropical setting, an oversized sun deck with ample seating and outdoor grills are all located onsite for your enjoyment. 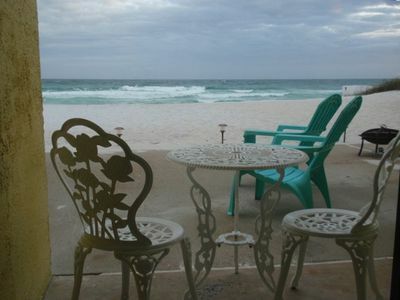 Complimentary beach service provided by the owners (including 4 chairs and 2 umbrellas-March-October). Open lobby area with onsite management. Vending and a DVD rental machine, fitness center and covered parking are all located onsite for your convenience and security. 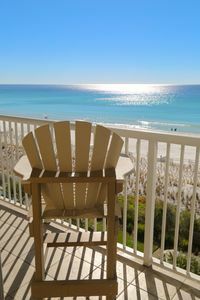 **BOOK** your beach getaway now and enjoy all that the Emerald Coast has to offer in the elegant comfort of Waters Edge! 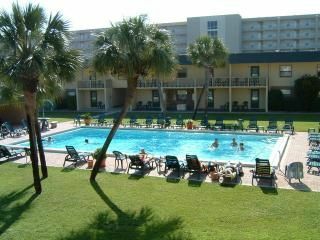 Islander 1-302 - Booking spring vacays, now! Waterscape B605 - Spring availability – won’t last long! Waterscape A622! Amazing Pools! Booking Spring/Summer 2019 Now! 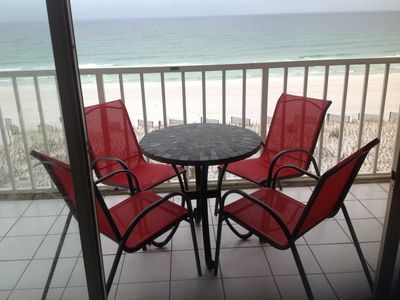 Seacrest 608 - Don’t miss your spring vacation. Book now! 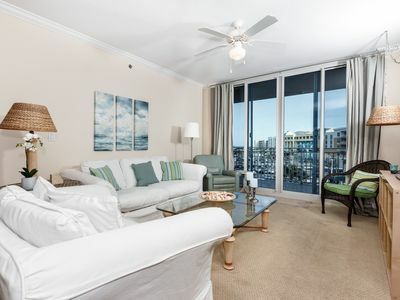 The Palms 305 - Act fast, for best spring availability. 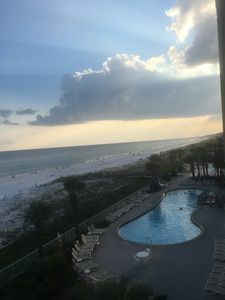 Waterscape B104 ~ Dual Master BRs ~ Ground floor & Closest 2BR to the beach! NEW LISTING! 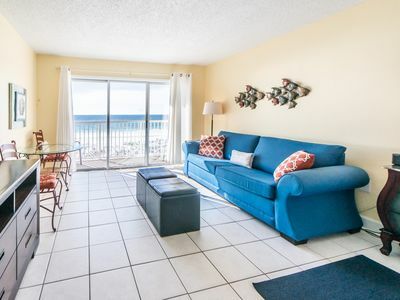 Dog- friendly oceanfront condo w/free WiFi, near the beach!